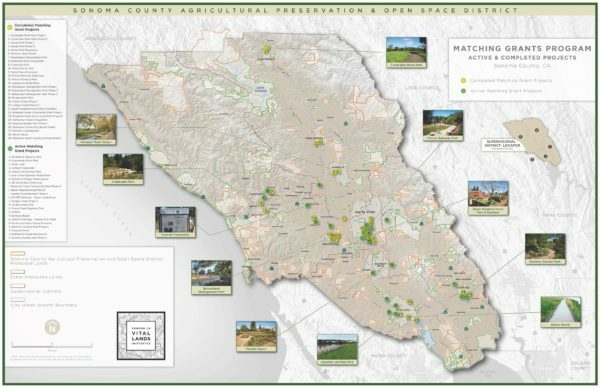 Every other year, Ag + Open Space, through our competitive Matching Grant Program, provides funding to public agencies and nonprofits for the protection of open spaces within Sonoma County communities for local agriculture, community recreation, natural resource restoration, and public access. Since 1994, this unique program has provided over $30 million towards projects in all nine incorporated cities and in multiple unincorporated areas, allowing our partners to leverage that funding to develop diverse and innovative projects throughout our county. For more information, contact Jennifer Kuszmar at jennifer.kuszmar@sonoma-county.org or 707/565.7266.